Hello, everyone! I hope you are having an amazing day. Today I would like to share with you a pattern for cute crochet baby flats/booties for little girls. They are made with gray yarn and have a big colorful bow on the front which is attached to the left and right front part of the shoe. The pattern is very easy and beginner friendly. But if you will have any troubles along the way, jump to the video tutorial that will show you step by step instruction on how to make this little shoes from the strat to the finish. YARN: For this pattern, I am using some Super Fine Merino DK weight yarn (here!) in gray and Sport weight yarn (here!) in pink/blue/yellow. You can use any color you prefer. The pattern is written in rounds. At the end of each round join the round with a ss. After each row turn and make a chain to lift a row. You can find this crochet pattern available as an inexpensive, ad-free, beautifully designed photo tutorial PDF in my Etsy (here! ), Ravelry (here!) and Love Crochet (here!) shop. The pattern includes additional size (6 – 12 months). Start with a merino DK weight yarn. Ch 10. Start in the 2nd ch from the hook. Round 1: 2 hdc. Hdc 7. 6 hdc. Hdc 7. 2hdc. Join the round with a ss. = 24 sts. Round 2: Ch 1. Work 2 hdc into next 2 sts. Hdc 7. Work 2 hdc sts into next 6 sts. Hdc 7. Work 2 hdc into next 2 sts. Join the round with a ss. = 34 sts. Round 3: Ch 1. Repeat (2 hdc, 1 hdc) 2 times. Hdc 7. Repeat (2 hdc, 1 hdc) 6 times. Hdc 7. Repeat (2 hdc, 1 hdc) 2 times. Join the round with a ss. = 44 sts. Round 1: Ch 1. BPhdc all the way around. Join the round with a ss. = 44 sts. Round 2: Ch 1. Sc 44. Join the round with a ss. = 44 sts. Round 3: Ch 1. Sc 11. Repeat (hdc2tog, 1 hdc into next 2 sts) 5 times. Hdc2tog. Sc 11. Join the round with a ss. = 38 sts. Round 4: Ch 1. Sc 12. Hdc 1. Hdc2tog. Repeat dc2tog 4 times. Hdc2tog. Hdc 1. Sc 12. Join the round with a ss. = 32 sts. Round 5: Ch 1. Sc 11. Hdc2tog. Repeat dc2tog 3 times. Hdc2tog. Sc 11. Join the round with a ss. = 27 sts. Continue with a Cotton Sport weight yarn in a color you like. You will need two bows. For each shoe one. Ch 9, but leave long tail for sewing before you make your first ch. Start in the 2nd ch from the hook. Row 1: Hdc 8. Turn. = 8 sts. Row 2 – 6: Ch 2. Dc 8. Turn. = 8 sts. Row 7: Ch 1. Hdc 8. = 8 sts. Take a strand of yarn in the color of your bow. Bend the middle of your rectangle/bow base and wrap your strand of yarn around it a few times. Knot the yarn to the back of the bow. Take a yarn needle and sew the bow on the sides of the shoe as seen in the picture. Hope you enjoyed this pattern! 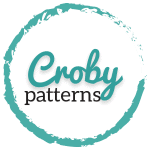 If you did, please share a photo of your creation with me using #crobypatterns on Facebook or Instagram. I love these little shoes!!! Thank you!!! Thank you so much for your wonderful free patterns and also for the easy illustrations. I do enjoy working on them as they are so easy to follow. God bless you girl. You rock! i love these and have found both your video tutorial s and written patterns so easy to follow. i would love to make them in a bigger size for my friends little girl she is 18 mths and her foot measurements are 13cm, have you a pattern for these in this size?, im fairly new to crochet so haven’t quite developed the skills to increase the size myself! The easiest way is to use a larger crochet hook and a thicker yarn than the one specified in the pattern. Crochet one sole, then check if the final size of the sole is the size you want. If yes, continue on the upper part. If no, try with a larger crochet hook and a thicker yarn. You can read more about it HERE. I was also wondering if I should start each row knitting the same stitch as the SS, or the next one? You should start each row in the last st from the previous row and each round in the very first stitch from the previous round. Ss is just a joining st and does not count as a real st. But it can come useful if the back seam on the booties is a bit off. Then I usually start in the 2nd st of the round and push the entire round for one st on the right and end the round with my last st into the ss to achieve the same number of sts as written in the pattern. I love your patterns! They are easy to follow and so beautiful! Thanks for sharing your work. Wow,so easy . thanks so much for sharing in this joy. 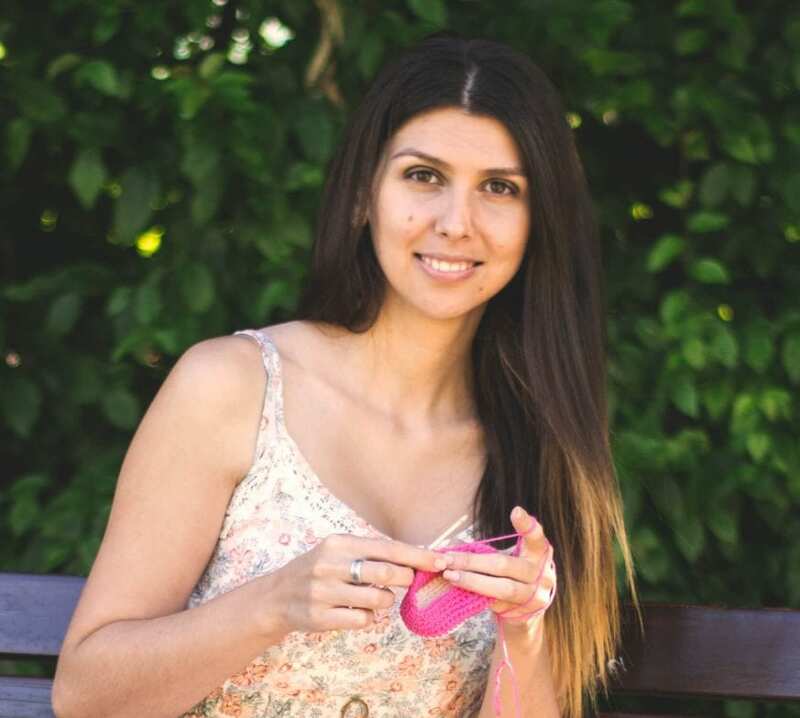 The best crochet tutorial ever….